116 SEUTTER, M. Novissima Ichnographica Delineatio... Ostendae. ( Augsbourg, ca.1730) Col. ancien. Fortes mouillures sur la partie gauche, quelques taches brunes. - Some water staining on the left half of the map. 490 x 580 mm. � Panorama d'Ostende surmont� du plan de la ville. 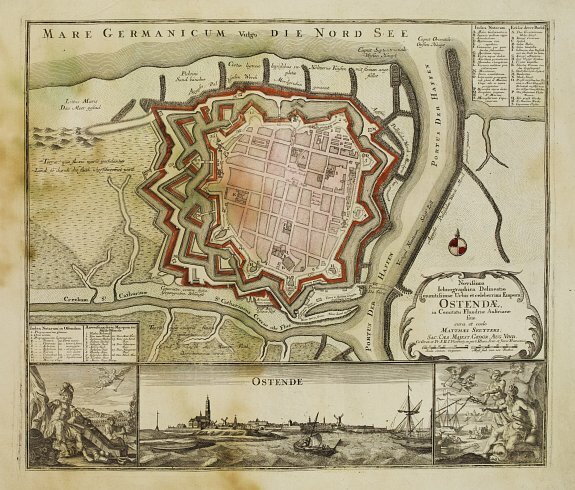 - A large scale plan of the city of Ostend surrounded by walls and moats. A numbered or lettered key to thirty-four sites identified both in German and in Latin. There are uncoloured engravings below the map; the larger is a panoramic view of Ostend seen from the sea; the two smaller are allegorical scenes. - Fauser 10 338. 118 DANCKERTS, Th./ L'ISLE, G. de / DEZAUCHE / BERNARD. Accuratissima Rheni Inferioris Mosae et Mosellae Tabula.. / Carte des Provinces Unies des Pays Bas.. / Provinces des Pais Bas.. ( Amsterdam/Paris, 1660-1737-1788) Limites en col. ancien. La carte de Danckerts est entoil�e, le papier un peu gris. - Maps are a bit age-toned but generally dark impressions. [Lot de 4 cartes]. Map of present-day Belgium was prepared by Nicolas de Fer, and re-issued by Bernard, dated 1737. (455x610mm). 120 LE ROUGE, G.L. La Zelande avec une partie de la Flandre Hollandoise. ( Paris, 1747) Limites en col. ancien. Papier l�g�rement jauni le long de la pliure m�diane. Infimes rousseurs marginales. 462 x 555 mm. � Belle carte de Z�lande. 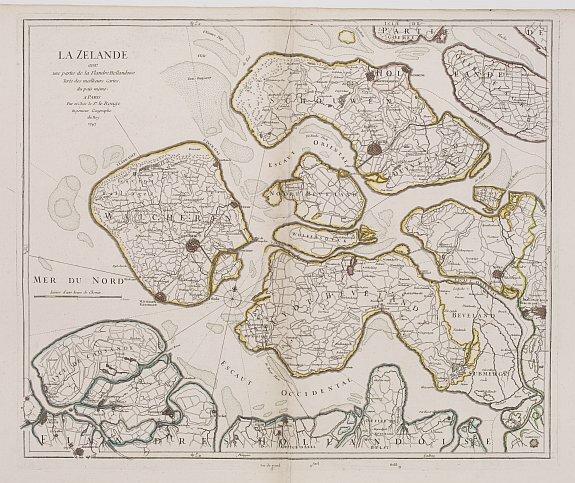 - Fine map of Zeeland by George Louis Le Rouge, who was active from 1740- till 1780 as a publisher and was appointed engineer for the King of France. From his Atlas Nouveau Portatif � l'usage des militaires et du voyageur� The atlas was dedicated to le Comte de Maurepas, and was sold by Le Rouge, Prault, Robinot and Briasson in Paris.